Two weeks ago, Techzim got the opportunity to test the PowerTel mobile broadband service. We’ve been using the connection as a primary for one of our laptops at the office, taking it through the paces and below is what we think about it. The review is in sections, so feel free to jump to a section you’re interested in if you don’t want to read the whole review. At the bottom, we conclude with some final remarks and our thoughts on the service. 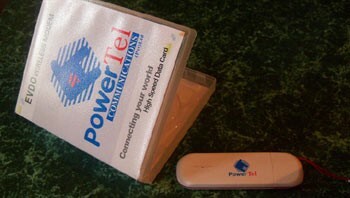 Like most mobile broadband services in Zim, PowerTel’s comes tied to the modem, i.e. you have to buy the modem plus the service from PowerTel. The modem costs USD $60 and comes with a 3G EVDO SIM card inside. That US$60 tag is about average in comparison to other services locally as well as globally. The mobile broadband service itself also has a good price by Zimbabwe standards: US $50 per month for uncapped bandwidth. Uncapped here means if you pay the US $50, you can download (and upload) as much data as you want without worrying about using up bundles. So far therefore, price wise, the PowerTel is one of the most affordable. Setup (on Microsoft Windows) is quite straightforward. You plug the modem into a USB port and let the installation program start. After that you click a few “next” buttons, a “finish” button and you’re all set to browse. If you’re not sure how to do this (click a couple of buttons i.e. ) the folks at PowerTel can set it up for you and explain the process while they’re at it. Either way, you’ll be connected in less than 5 minutes of unpacking your modem. The connection speed is not disappointing. You can open web pages and browse the internet at decent speeds, i.e. without waiting too long for pages to load. International web applications like Gmail, Econet Mail and others take about 30 seconds to load. Facebook, of course about a quarter of that. Loading local sites was surprisingly not any faster, leading us to suspect PowerTel’s mobile broadband (or part of it) is running on some VSATs upstream or some other international platform. Speed tests below also suggest the same thing. File download was a bit of a disappointment. Downloading an 80 megabyte anti-virus update file from the McAfee servers for example took about 1 hour during peak browsing time. We did single thread downloads using a basic Chrome browser for this. Optimized multithreaded downloading would probably take a little less. Again, downloading from a local site wasn’t any faster; a 20MB file on ZOL servers for example lasted a painful 40 minutes to download. In terms of upload, attaching a 0.2MB file to Gmail during peak time took about a minute. Attaching a 2MB file failed completely though, despite several tries. Midnight browsing was the pleasurable experience we expected. Web pages with heavy applications would open in just a couple of seconds. 5 seconds or so tops. File download also improved significantly; downloading an 87MB McAfee update file took a little more than 50 minutes. Streaming a YouTube video was the smooth experience it’s supposed to be. For those among you interested in knowing a bit more of the raw data: the highest latency to international servers we registered is 4000 milliseconds, the lowest 570 milliseconds and an average of about 900ms. Pings to local servers (zol.co.zw) gave the same maximum latency of just over 4000 milliseconds, but a lower minimum of 400 milliseconds and an average of 600. Again, not much difference between international and local performance. The figures kept changing though and trying to get a meaningful average was such a task. 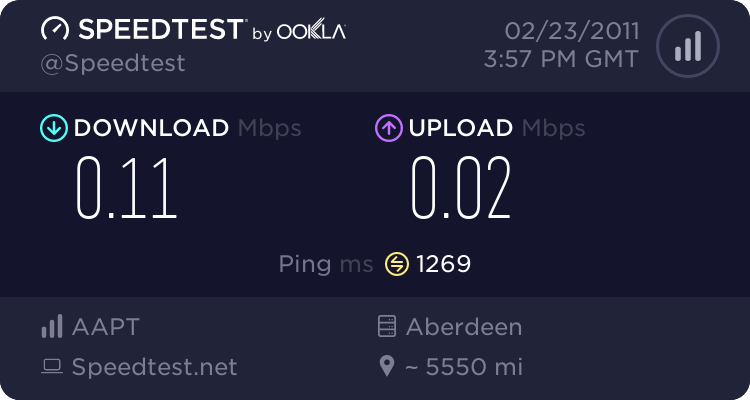 We did a broadband speed analysis with Ookla’s speedtest.net during peak time and below are two screenshots of the results. 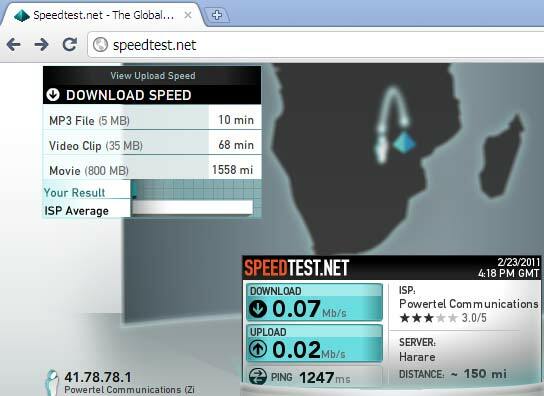 The first is a download/upload test on local servers (ZOL in Harare) and the second, International server in the UK. On the upper left corner of the images is the estimate time one should expect to wait downloading a music file, a video file, or a full movie. Stability wise, the connection is less than satisfactory. In fact at times it’s downright disappointing. The day we got the modem, and few days after that, we were very concerned with the frequent downtimes and almost got to a point where we thought maybe we could just let them fix it and review some weeks later. To be fair however, it’s been improving since. The service we’re getting today is a lot better than that of two weeks ago and you get the feeling there are people actively working to make things better. Still, PowerTel’s mobile broadband has been on the market for years, it’s not too much to expect them to have a solid network by now. Anyway, our experience overall was availability of about 80%. It is a problem especially during the day. The connection slows down significantly for a few minutes after every 2 or so of good browsing. Sometimes you can go for longer without experiencing any slowdown. Sometime is does get bad. Bad to the tune of as many as 5, 3 minute slowdowns in 2 hours. It’s really hard to predict how it’s going to perform on any given day. And needless to say, if you’re doing some important work online, this can be frustrating. It pushes you to need a backup connection. Our conclusion is that the service is usable but PowerTel needs to give a bit more tweaking. We were particularly disappointed with the slowdowns during the day. It would get in the way so much sometimes we just ended up switching to another provider. We feel that it will disappoint any customer expecting to just buy and connect to the web without any hitches. But the service also performed well enough to be suitable for some groups of users for whom stability is not a critical requirement. The type of user who can postpone their web browsing if the connection slows down. And like I said, at uncapped US $50 a month, this actually is a very attractive deal compared to other offers on the market. With the current price tag, if PowerTel’s broadband performed without any significant slowdowns, it would be by far the best mobile broadband deal in Zimbabwe. But that is obviously not the case. l got to test most if not all the modems available from Powertel and talk to people who are inside, its sad that we have a passionate company with everything in place to lift Zimbabwe places but lacking the technical acumen to guide itself. What information l got and witnessed inside Powertel offices is too critical to publicice here, but a major overhaul is required at Powertel. Dont get me wrong, l met the most amazing personnel who are ready to listen and help. techzim may not have noticed this but powertel does not appear to have a (working) website. I had to do a bit of hocus pocus before i could even find out where they are located. Anyway, in terms of speed and all, i would say the service is good, if you are not planning to download large files. Its also practical… buying data bundles from econet or anywhere else wont do if you have a new laptop (or even an old one) and have to download a lot of updates for Windows 7 and your anti-virus. I got the powertel thing last thing and a day after that, windows had downloaded up to 1, something gig in updates. Of course the updates are optional but since most are security related, there does not seem to be any way of getting around them without compromising your system. 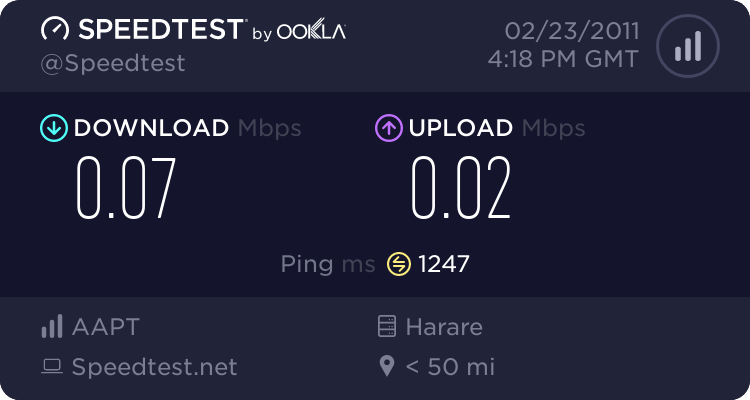 If Econet, in their pre-data bundle era, could charge $25 dollars per month for an unlimited internet connection, what prevents Powertel from doing even better? How do these companies come up with their prizes anyway. Do they use hakata or a set of accountants? They do not even offer promotions. Elsewhere in the world, if one pays for a certain number of months at once, one gets a certain number free. Anyway, I rest my case before i start foaming on the mouth because… for those who can afford it, the powertel product is the most practical on the market so far. Otherwise, stick to internet on your mobile phone. While it is good news there is competition in the internet supply market, I have my serious reservations about any wireless technology, especially one that is not charged per mega byte. When it is uncapped many people will abuse it with continuous downloads etc. And as it is wireless when you are hogging the airways and international connections it affects all of us. Many of these services start off good, but get too congested and faulter. I would like to see a wireless ISP adopt cheap prepaid metered billing, Econet have gone this route but I have not had good results with their service at the price. Also the fact that powertel appears to not be linked into ZINX (the Zim link between local ISPs) is very strange, why would they not want to do that, it means local zim traffic is basically free to them. 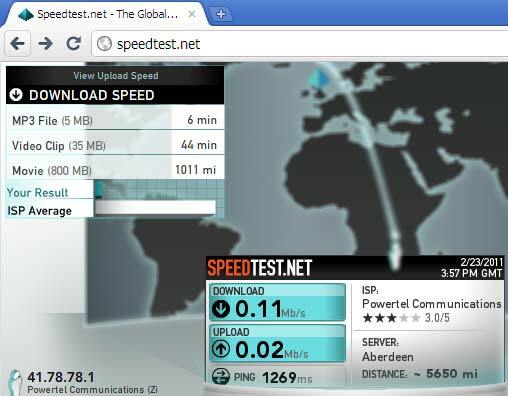 Did you manage to test speeds to another powertel IP to see what their network was like? Sorry, no. didn’t think to do that. We still have the modem for another 2 days so will try it today. What about coverage? is it just Harare or the rest of the country as well? Seems it’s still pretty much this for now: Hre, Byo, Gweru & Kwekwe. 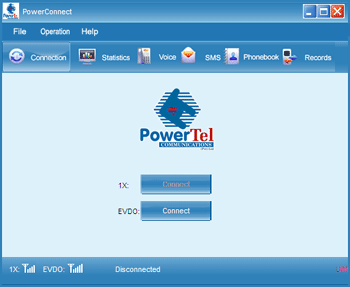 oh well!,we are waiting for Powertell here in Marondera,can’t wait,my company spends over $25 per day on Econet bundles,even with most,if not all updates disabled,inc anti-virus…so those who are complaining about Power’s $50 uncapped deal,dunno what we are gpoing through!…I will take Power’s deal anytime,anywhere where there is coverage and save a fortune along the way,bring it on!…can’t wait to give Econet the big boot,that’s how fed up I am with these chancers!…. as said, internet bundles are not really practical, what with microsoft bringing so many updates for even the new Windows 7. One wonders why they release the thing in the first place if it has to be patched up so often. While we may be happy to complain about powertel, we are doing so happily, considering the alternative. Its just that not all of us have companies and no civil servant or student will ever get the service if it remains priced at $50 a month. Still, i cant find the powertel website. Hmm Hmm Powertel yakadhakwa.Although they say its uncapped internet,you can barely download anything. CDMA simply translates to a fixed number of users per node. So Powertel has to install base stations at a rate directly proportional to dongle volumes they sell. Otherwise they are the best service today, I can testify. About the technical expertise of the employees, that’s an HR puzzle very difficult to solve. is it legal to use satelitte for broadband or even for an internet cafe? I suspect where you are located may play quite a big role in the overall performance of PowerTel’s connection. I’ve been using it for a while now and have not really experienced downtime or fluctuaions to the same extent as mentioned in your review. I can’t believe that some people are complaining about the price. $50 for uncapped internet (with decent speeds)? C’mon…. And for the people saying you can’t download any large files, you can provided you are able to use some sort of download manager and are willing to be a bit patient. I can normally start a movie at night and leave it downloading and the next morning it’s done – I may beable to do the same with Africom and Econet but that would squash the monthly Africom bandwidth and for Econet it would cost me something like $80-90 – expensive movie! PowerTel will remain my main internet connection until something better comes along! Sure thing hey. We’re working on reviews for the other mobile broadband providers and we’ll post them here. check back! are there other mobile SPs besides econet,africom and powertel in Zim? what about torrents?were they fast? We are a factory of 3.5G HSDPA/HSUPA/EVDO USB Modem,module &3G router with high quality and competitive price. OEM&ODM are supplied, User interface/packing/logo brand can be customized. Hope to cooperate with you! 1.We are a Global Manufacturer Certificate factory, not a trading company. 2.We have own technical team,they can deal with all questions from software and hardware at any time. 3.Our modem can free drive Mac OS,it can support Winows CE,Android OS,UBUNTU 8.04. 4.Our modem have Voice call facility and USSD function. 5.User interface/packing/logo brand can be customized. how is it that when you relocate you don’t inform your clients my modern stopped working last night and i went to where your offices where in Gweru and told you no longer exist in Gweru i am losing business as we speak, they told me they can’t help me. How is Powertel coverage in Hatfield? I need to know before I take the plunge. It seems to me that Powertel,Africom are not operational in areas that are some 50km out of the capital.Is there anything they are doing to improve?